When is a house more than a home? When it’s a mission that it be used as a blessing. Since 2000, Elizabeth and Michael Darby have used their home Still Waters in this way. The Darbys and their highly-attuned spiritual gratitude can be found nearly everywhere in their Lake Burton home. In fact, the twenty-third Psalm greets visitors upon entry. Hand-painted on a high wooden beam, the Bible verse sets the tone for the home which is peaceful and inviting. 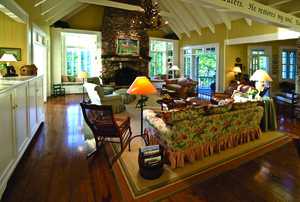 Elizabeth Darby designed the home with the help of Atlanta architect Todd Pritchett. Together they maximized living space, views, gracious amenities and storage. Elizabeth has been told that she designed a home with everything in it a woman would love. That includes bolstered window seats with views of the lake in nearly every room, walk-in closets, storage space tucked under stairs and beneath the broad eaves and room to sleep over twenty guests. At the same time, Still Waters retains an intimate sense of scale that doesn’t overwhelm. On entering, the wide stacked-rock fireplace soars to the open-beam ceiling where flanking windows offer views of the nearby lake. Beneath a grand antlered chandelier, a low built-in console conceals the television while allowing an open-concept sight-line because Elizabeth loves ‘see-through homes’ where views remain unimpeded across a wide space. Just off the casual breakfast area, a large screened-in porch wraps around the front of the house and provides glorious views of the sunset and lake. Past the porch, an outdoor barbeque grill and flag-stone landing lead back into the kitchen through a Dutch door into the butler’s pantry. The kitchen itself boasts a large central island that holds the gas cooktop and seating for three. 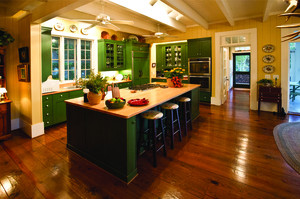 A baking center, wide butcher-block counters and glass-fronted cabinets make the kitchen attractive and functional. The master suite stands on the opposite side of the house, tucked quietly behind a recessed entryway and reading nook. A large walk-in closet with built-in shelves offers enough separate storage for any couple, and a washer and dryer to boot. Clustered around the mirror of the dual sink vanity are positive affirmations and Bible verses for good health and healing that again testify to the couple’s faith. Former missionaries, Elizabeth and Michael designed the downstairs space to host their discipleship ministry weekends. 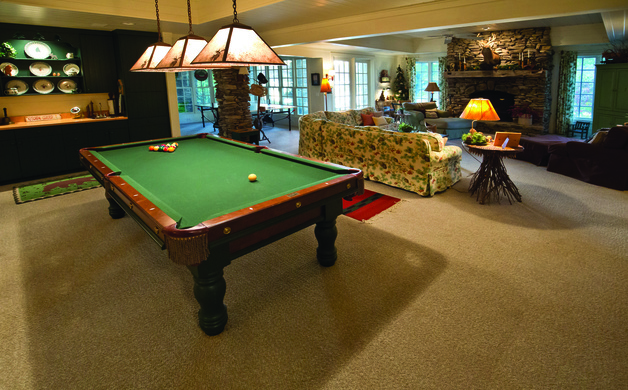 The recreation area comfortably contains not only a pool table, but a ping-pong table as well. There’s also a generous seating area, a gift-wrapping station, laundry room, guest room with ensuite bath and a bunkhouse with custom-made bunks for eight on the walk-out level to the lake. Upstairs, the split staircase leads to three more bedrooms and full baths. A wide walkway unites the sleeping areas while offering a cozy reading area open to the living room below. And there’s more. A separate cabin on the property can house even more company. Originally the home’s garage, the Darbys created a charming cabin where they lived while their home was being built. Complete with a kitchen, full bath, separate sitting area and generous bedroom, the cabin with its flagstone porch is a rare amenity on the lake. The new two-car garage up by the main house offers its own office/guest room with a full bath. The Darbys know they are blessed. Five years ago when the tornado tore down the shore across from them on Timpson Cove, they were largely spared. Elizabeth says she feels the home belongs to the Lord and they are blessed to be its stewards. This loving and gracious attitude infuses the home and brings peace to all who enter. Still Waters is offered through Tom Stanfill with Re/Max of Rabun. For information or to schedule an appointment to see the home please contact Tom at 770.355.0659 (cell) or 706.782.7133 (office) or visit www.tomstanfill.remax-georgia.com.